New paper: "Labor Force Dynamics in the Great Recession and Its Aftermath: Implications for Older Workers"
"Labor Force Dynamics in the Great Recession and Its Aftermath: Implications for Older Workers"
Unlike prime-age Americans, who have experienced declines in employment and labor force participation since the onset of the Great Recession, Americans past 60 have seen their employment and labor force participation rates increase. In order to understand the contrasting labor force developments among the old, on the one hand, and the prime-aged, on the other, this paper develops and analyzes a new data file containing information on monthly labor force changes of adults interviewed in the Current Population Survey (CPS). The paper documents notable differences among age groups with respect to the changes in labor force transition rates that have occurred over the past two decades. What is crucial for understanding the surprising strength of old-age labor force participation and employment are changes in labor force transition probabilities within and across age groups. - Like workers in all age groups, workers in older groups saw a surge in monthly transitions from employment to unemployment in the Great Recession. - Unlike workers in prime-age and younger groups, however, older workers also saw a sizeable decline in exits to nonparticipation during and after the recession. While the surge in exits from employment to unemployment tended to reduce the employment rates of all age groups, the drop in employment exits to nonparticipation among the aged tended to hold up labor force participation rates and employment rates among the elderly compared with the nonelderly. Among the elderly, but not the nonelderly, the exit rate from employment into nonparticipation fell more than the exit rate from employment into unemployment increased. - The Great Recession and slow recovery from that recession made it harder for the unemployed to transition into employment. Exit rates from unemployment into employment fell sharply in all age groups, old and young. - In contrast to unemployed workers in younger age groups, the unemployed in the oldest age groups also saw a drop in their exits to nonparticipation. Compared with the nonaged, this tended to help maintain the labor force participation rates of the old. - Flows from out-of-the-labor-force status into employment have declined for most age groups, but they have declined the least or have actually increased modestly among older nonparticipants. Some of the favorable trends seen in older age groups are likely to be explained, in part, by the substantial improvement in older Americans’ educational attainment. Better educated older people tend to have lower monthly flows from employment into unemployment and nonparticipation, and they have higher monthly flows from nonparticipant status into employment compared with less educated workers. - A serious recession inflicts severe and immediate harm on workers and potential workers in all age groups, in the form of layoffs and depressed prospects for finding work. - Unlike younger age groups, however, workers in older groups have high rates of voluntary exit from employment and the workforce, even when labor markets are strong. Consequently, reduced rates of voluntary exit from employment and the labor force can have an outsize impact on their employment and participation rates. - The aged, as a whole, can therefore experience rising employment and participation rates even as a minority of aged workers suffer severe harm as a result of permanent job loss at an unexpectedly early age and exceptional difficulty finding a new job. - Between 2001 and 2015, the old-age employment and participation rates rose, apparently signaling that older workers did not suffer severe harm in the Great Recession. - Analysis of the gross flow data suggests, however, that the apparent improvements were the combined result of continued declines in age-specific voluntary exit rates, mostly from the ranks of the employed, and worsening reemployment rates among the unemployed. The older workers who suffered involuntary layoffs were more numerous than before the Great Recession, and they found it much harder to get reemployed than laid off workers in years before 2008. The turnover data show that it has proved much harder for these workers to recover from the loss of their late-career job loss. Wisconsin Republican Rep. Reid Ribble recently introduced the “Save Our Social Security Act,” which combines tax increases and benefit reductions to restore Social Security to 75-year actuarial balance. The bipartisan bill has been co-sponsored by Reps. Dan Benishek (MI), Jim Cooper (TN), Cynthia Lummis (WY), Scott Rigell (VA) and Todd Rokita (IN). More information is available at Rep. Ribble’s web page, but following are the main provisions of the bill and the percentage of the 75-year actuarial deficit that each provision would address. Changes to the formula factor used to calculate benefits of high earners from 15% to 5% over 5 years or 2% a year from 2017-2021. Phase-in of adding 2 months to retirement every year for 12 years (currently 1 month). Increase the NRA 1 month every 2 years to keep up with life expectancy and the ratio of work/retirement, examined every 10 years in case of needed adjustments. CPI-U is a more general index and seeks to track retail prices as they affect all urban consumers. Encompasses about 87 % of the U.S. population. CPI-W is a more specialized index and seeks to track retail prices as they affect urban hourly wage earners and clerical workers. Places a slightly higher weight on food, apparel, transportation, and other goods and services. It places a slightly lower weight on housing, medical care, and recreation. Changes a portion of how benefits are calculated to be based on highest 38 years of work instead of the current 35. Provides a point of order against consideration of any spending or tax legislation that would cause Trust Fund totals to be less than needed for the covered fiscal year. Annuities assure a lifelong income stream and – compared to other draw-down options – can provide attractive payouts, which can help cover late-life health costs. automatically putting a portion of 401(k) assets in an annuity, perhaps an Advanced Life Deferred Annuity that kicks in later in retirement. Like workers in all age groups, workers in older groups saw a surge in monthly transitions from employment to unemployment in the Great Recession. Unlike workers in prime-age and younger groups, however, older workers also saw a sizeable decline in exits to nonparticipation during and after the recession. While the surge in exits from employment to unemployment tended to reduce the employment rates of all age groups, the drop in employment exits to nonparticipation among the aged tended to hold up labor force participation rates and employment rates among the elderly compared with the nonelderly. Among the elderly, but not the nonelderly, the exit rate from employment into nonparticipation fell more than the exit rate from employment into unemployment increased. The Great Recession and slow recovery from that recession made it harder for the unemployed to transition into employment. Exit rates from unemployment into employment fell sharply in all age groups, old and young. In contrast to unemployed workers in younger age groups, the unemployed in the oldest age groups also saw a drop in their exits to nonparticipation. Compared with the nonaged, this tended to help maintain the labor force participation rates of the old. Flows from out-of-the-labor-force status into employment have declined for most age groups, but they have declined the least or have actually increased modestly among older nonparticipants. A serious recession inflicts severe and immediate harm on workers and potential workers in all age groups, in the form of layoffs and depressed prospects for finding work. Unlike younger age groups, however, workers in older groups have high rates of voluntary exit from employment and the workforce, even when labor markets are strong. Consequently, reduced rates of voluntary exit from employment and the labor force can have an outsize impact on their employment and participation rates. The aged, as a whole, can therefore experience rising employment and participation rates even as a minority of aged workers suffer severe harm as a result of permanent job loss at an unexpectedly early age and exceptional difficulty finding a new job. Between 2001 and 2015, the old-age employment and participation rates rose, apparently signaling that older workers did not suffer severe harm in the Great Recession. Analysis of the gross flow data suggests, however, that the apparent improvements were the combined result of continued declines in age-specific voluntary exit rates, mostly from the ranks of the employed, and worsening reemployment rates among the unemployed. The older workers who suffered involuntary layoffs were more numerous than before the Great Recession, and they found it much harder to get reemployed than laid off workers in years before 2008. The turnover data show that it has proved much harder for these workers to recover from the loss of their late-career job loss. "Means Testing of Public Pensions: The Case of Australia"
The Australian age pension is noncontributory, funded through general tax revenues and means tested against pensioners, private resources, including labour earnings. This paper constructs an overlapping generations (OLG) model of the Australian economy to examine the economy wide implications of several counterfactual experiments in the means testing of the age pension. These experiments include policy changes that both relax and tighten the existing mean test. We also consider a policy change that only exempts labour earnings from the means testing. Our simulation results indicate that tightening the existing means test combined with lower income tax rates leads to higher labour supply, domestic assets and consumption per capita, as well as to welfare gains in the long run, while labour earnings exemptions from the means testing have largely positive effects on labour supply at older ages. Population ageing is shown to further strengthen the case for the pension means testing. "How Well Does the Australian Aged Pension Provide Social Insurance?" Social security plays an essential role in an economy, but if designed incorrectly can distort the labor supply and savings behavior of individuals in the economy. We explore how well the Australian means-tested pension system provides social insurance by calculating possible welfare gains from changing the settings in the current means-tested pension system. This work has been explored by other researchers both in Australia and in other pension-providing economies. However, most research ignores the fact that welfare gains can be found by reducing the cost of the program. To exclude these welfare costs, this paper fixes the cost of the system. We find that the means-tested pension system is welfare reducing, but does provide a better outcome than an equivalent-costing PAYG system. We also find that if the benefit amount is held constant, and hence the cost of the pension program is allowed to vary, a taper rate of 1.0 is optimal. However, once we fix this cost, a universal benefit scheme provides the best welfare outcome. There’s a big debate about how well Americans are saving for retirement. The major source of that debate is disagreement on how much a person ideally should save – some people claim you should have retirement savings equal to 8 times your final salary; others say 12; still others say 20. But what does this mean? Over at Forbes I’ve tried to shed some light on this by including an interactive online calculator that lets the user analyze retirement saving needs for Americans of different income levels. You decide what kind of replacement rate different retirees need and the calculator figures out how much they need to save. The results may surprise you. You can check out the article and calculator here. Steve Goss has been Chief Actuary at the Social Security Administration since 2001. Mr. Goss joined the Office of the Chief Actuary in 1973 after graduating from the University of Virginia with a MA in Mathematics. He graduated from the University of Pennsylvania in 1971 with a BA, majoring in mathematics and economics. Mr. Goss is a member of the Society of Actuaries, the American Academy of Actuaries, the National Academy of Social Insurance, the Social Insurance Committee of the American Academy of Actuaries, and the Social Security Retirement and Disability Income Committee of the Society of Actuaries. A key component for estimating the optimal size and structure of disability insurance (DI) programs is the elasticity of DI claiming with respect to benefit generosity. Yet, in many countries, including the United States, all workers face identical benefit schedules, which are a function of one’s labor market history, making it difficult to separate the effect of the benefit level from the effect of unobserved preferences for work on individuals’ claiming decisions. To circumvent this problem, we exploit exogenous variation in DI benefits in Austria arising from several reforms to its DI and old age pension system in the 1990s and 2000s. We use comprehensive administrative social security records data on the universe of Austrian workers to compute benefit levels under six different regimes, allowing us to identify and precisely estimate the elasticity of DI claiming with respect to benefit generosity. We find that, over this time period, a one percent increase in potential DI benefits was associated with a 1.2 percent increase in DI claiming. This paper compares Social Security means tests that would reduce benefits for recipients who fall in the top quarter of the income distribution with means tests aimed at those in the top quarter of the wealth distribution. Both means tests would reduce the average benefits for the affected groups by about $5,000. The analysis is based on data from the Health and Retirement Study and covers individuals aged 69 to 79 in 2010. About 14.5 percent of retirees in this age group are both in the top quarter of income recipients and in the top quarter of wealth holders. Another 10.5 percent are top quarter income recipients, but not top quarter wealth holders; with an additional 10.5 percent top quarter wealth holders, but not top quarter income recipients. We find that a means test of Social Security based on income has substantially different distributional effects from a means test based on wealth. Moreover, there are substantial differences when a Social Security means test based on income is evaluated in terms of its effects on individuals arrayed by their wealth rather than their income. Similarly, a means test based on wealth will be evaluated quite differently by policy makers who believe that income is the appropriate basis for a means test than by those who believe that means tests should be based on wealth. …financing corrections postponed from today until the early 2030s would need to take effect virtually immediately and be several times as painful, rendering enactment highly implausible. It would be far likelier then that legislators would resort to subsidizing Social Security from the government’s general fund. This would end longstanding arrangements through which Social Security has enjoyed unique popular support because it is perceived as a separate, self-financing program of benefits workers have earned with their payroll taxes. The Wharton School at the University of Pennsylvania has released a new Social Security simulation model that allows users to build their own reform plan. What’s interesting about the simulator is that it’s built on an independent microsimulation model of Social Security’s finances rather than pre-run reforms chosen by SSA’s actuaries. This means that as the model is further developed, additional reform options may become available, as well as outputs on the distribution of Social Security benefits. Well worth checking out. Coming up tomorrow! I'll be speaking at this event and promise a stimulating discussion. What is the extent of the retirement savings gap in America? How can public policy expand participation in workplace retirement plans? This event has been organized to meet the requirements for a widely attended event as set forth in the Congressional ethics rules. If you have any questions, please email mcoglianese@thirdway.org. Is Social Security in Even Worse Shape Than We Thought? Possibly. 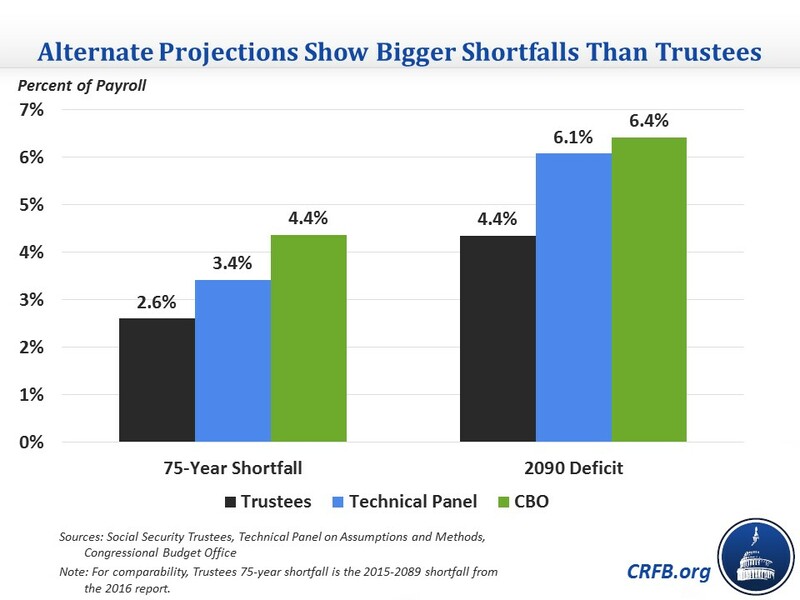 While the Social Security Trustees’ projections for Social Security’s finances get the most media attention, there are two other sets of projections – from the Congressional Budget Office and the Social Security Advisory Board’s Technical Panel on Assumptions and Methods. And both find a larger long-term deficit than do Social Security’s Trustees. Click here to read the Committee for a Responsible Federal Budget’s blog post on the subject. Worth reading. Upcoming Event: Retirement Policy in the New Economy, Hosted by Third Way. July 13. What is the extent of the retirement savings gap in America? How can public policy expand participation in workplace retirement plans?